Hi! I found your post at The Scoop linkup party. 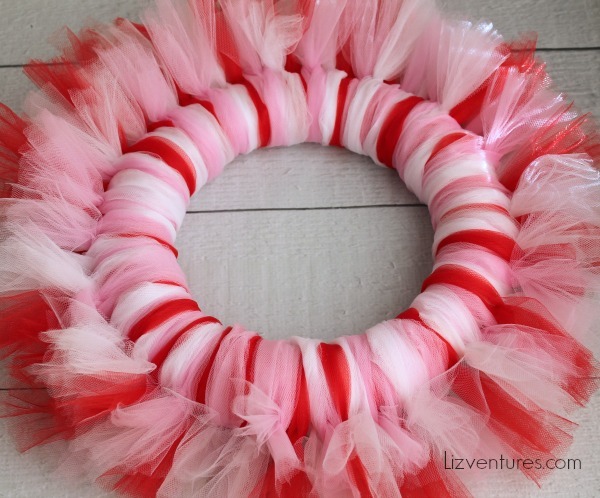 I have a bunch of tulle, so I may try this wreath. 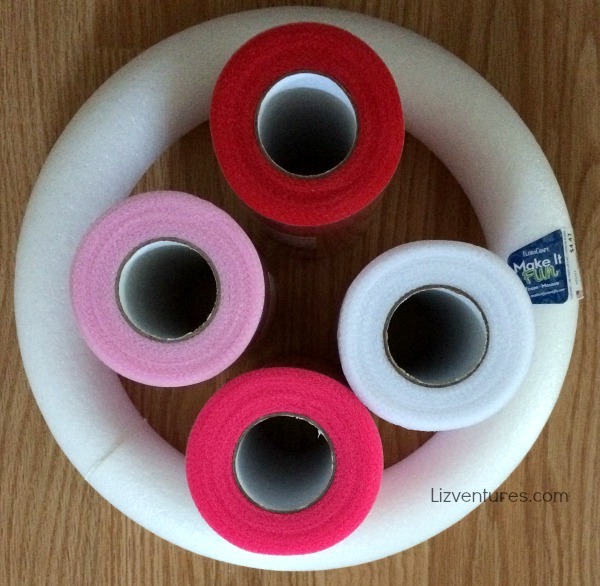 I also have some pool noodles that I might try instead of the styrofoam wreath form. The pink one would work! I would love to know if the pool noodle works. Great upcycling idea! Love how pretty and simple this looks! I keep meaning try try a tulle wreath… maybe I’ll make one for St. Paddy’s Day! What girl doesn’t like a little tulle. Love the look! Thanks so much for sharing on Merry Monday. Pinned. Just ran out to get a few different shades of green to make this for St. Patrick’s Day. If I’m lucky, it’ll turn out well! I love it. I want to run to Michael’s right now and attempt it with my daughter! So cute! That looks really easy! Thank you so much for sharing! What a great wreath! Love it! Pinned and tweeted. We love to party with you, so I hope to see you tonight at 7 pm. That would be so awesome. Awesome tutorial and project Liz! Congrats – you are one of our Featured Guests at this week’s Inspire Me Monday party – #162 – at Create With Joy! “Your wreath is so adorable! Thanks for linking up with me. I’m featuring you this week! This is just soo cute! I love the way it spreads out 🙂 I think it would be so adorable as a mini ornament! Popping over from Treasure Box Tuesday =) Huge fan of tulle wreaths. My mom made one for a child in our family and hung her age in the center. Each year she sends her the next number to hang for her birthday. Be sure to share your crafts & DIYs at Two Uses Tuesday (Mon 11pm EST to Fri 11pm EST) over at Sarah Celebrates if you don’t already! Cute! I’ve made a couple tulle wreaths for the 4th of July and my daughter’s 1st birthday, and they are fun to make. I like the artsy square in the middle. I love the colors and design, . You’re wonderfully crafty! Oh that wreath turned out amazing!!! I love how the colors pop out and would dress up a door or room. That is so cute & I have seriously seen these materials out our Dollar Tree recently I could make this for $4! I gotta try it at that price! Thanks for sharing how! Visiting today from Inspire Me Monday! Great tutorial! I have been wanting to try out a tulle wreath. Less intimidating now. hehe. Pinned for later. that’s so simple even I could do it! I think it’s adorable with your Love You More sign, too! Very cool idea! Love the fact that a change of color would work with any time of the year! Thank you for sharing! I think the square art adds just the right touch. This is so festive! I bet even I could pull it off, and I’m creatively challenged. I’m going to try to make a St. Patrick’s Day version with different shades of green. This looks so cute! Very cute, the colors are perfect and I love your art. I’m like you not mushy mushy! What a beautiful tulle wreath! I love the color combinations you used and the center piece really pops. I think it’s sweet that you added a phrase you share with you boyfriend. Adorbs! That would look so cute for a kids birthday party too! Bobbi made of these last year for St. Patricks day and Easter. They look really nice hanging on the doors. wow, this is adorable! thanks for sharing the wonderful tutorial. Awwww, that is so cute. And it looks pretty easy to make. I think I might even be able to do this. Thanks for the how to. 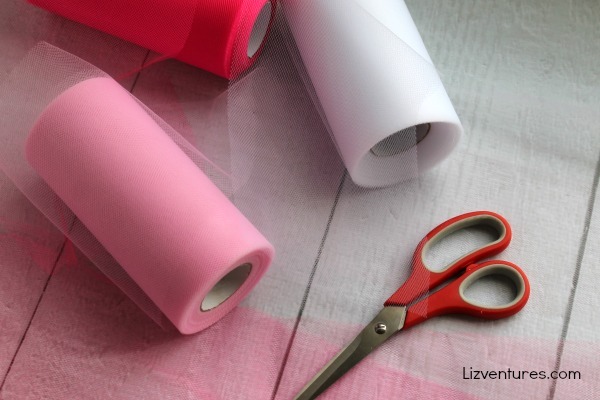 Such a fun and simple Valentine’s Day decor to make. It’s fun and would look good in any room in the house. I miss those days when I was a hopeless romantic! I’m not much of one these days either, but I’ll have to admit that this wreath is pretty cute. I love this craft! What a fun and creative craft to do with the kids. I really like the nice colours. My husband and I are kind of sappy too. 🙂 He is more romantic than me, though. I love your tulle wreath and just might give it a try myself. What a pretty wreath! This definitely looks like something I can make with my daughters. Thanks for sharing! “I love you more crap”…. hahaha! That cracked me up, because we do it too. Haha, my husband is the romantic cuddler one and I’m like you! This is such a cute idea! I love working with tulle. This is adorable, I could use a few for my dining room or even give as gifts. What a cute wreath and looks super easy to make! Thanks for sharing. This is so adorable. This is also a wonderful tutorial. I love the step-by-step. It looks fairly easy, so I should be able to work it out. Wow! I would actually pay for something like this! Looks really beautiful and definitely Valentine’s! Very lovely! Awwww. I love this! I would love to make this for Valentine’s Day. It is one of my favorite holidays! I havent tried a Tulle wreath yet. You make it look easy though. Turned out great! how gorgeous…thanks for sharing the tutorial! That is a gorgeous wreath! I love how you made it your own with that art piece! That turned out SO pretty! I just love holiday decorating! That is a gorgeous wreath. I love that this is an easy craft, that it’s one I might even be able to do! That’s a really cool art find, and I love how it ties into the ‘mushiness’ (lol) that you share with your sweetie. I can’t help it, every time I see a tulle wreath, it makes me want to wear it was a tutu. That is oh so many super cute. I love how it turned out. I don’t really decorate for Valentine’s Day, but I can totally see me making this green and white and gold for St. Patricks Day. Thanks for the idea Liz! Super cute! I made a red one so I could use it at valentines and Christmas.. This turned out fantastic. I will have to make one to put on my door. I love how easy it is to make. What a fun idea! I love decorating and crafting for valentines day! That is a super cool wreath! I love festive wreaths like that! That is so cute! Thank you for the tutorial, I just bought a wreath hanger for Christmas and now I want a wreath for every season! Isn’t it? Shes making me want to decorate for all holidays, now too. Really really cute! I would love to hang this on my front door. And, I love the “Love you more” sign you have. Looks great! I love how easy this wreath is to make and the festive colors. It is perfect for Valentine’s Day. That is super cute. I want to make something like that for my front door but I am SO not crafty. That is why I cook instead! That is a really pretty wreath. I doubt I would have the patience needed to make it but if someone were to hand it to me I would be proud to hang it on my door! My goodness, this looks so beautiful. The colors are just awesome & mind blowing. I never thought this could be done so easily. A great wreath for Valentine’s day for sure. That’s beautiful! You must have had such patience to make that. Now I seriously want to make one. 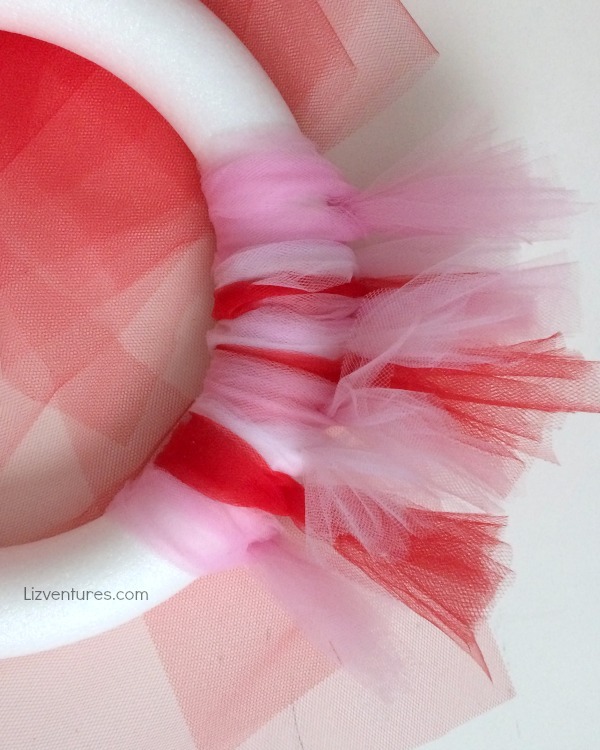 I tried to make a tutu before for Disney Halloween party – but this is so much better! 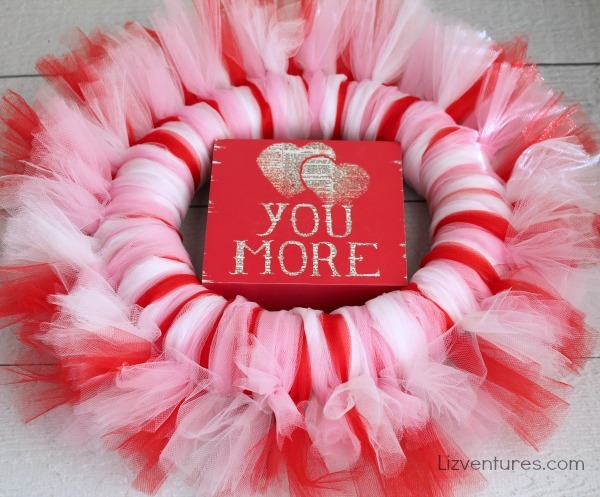 Such a great wreath for Valentine’s Day, or just to put in a little girl’s room. Love the print, too. I didn’t even think of that. It would make a beautiful decoration for a little girl’s room. I am loving these bright colors. I love making my own wreaths but have never tried with tulle. wow…now that is a vivid wreath…. That looks like a fun craft to spend some time on. I don’t really have VDay decorations, so this would be nice. Oh my gosh, I love that! I’ve always wanted to make something with tulle but I wasn’t really sure what to do with it (other than a tutu). I think I’m gonna let the girls make one of these. that is very cute! And totally doable too! 🙂 I Love easy crafts! I’m not much into crafts but this looks pretty and pretty simple. Can you give me an idea what the cost of making a wreath like this would be, in case I wanted to buy supplies to have a group make them? Thanks. I knew several friends with little girls who’d love to make this for them! This would be so fun to do with the kids. I know my girls would love it. this is SO cute! I am going to hobby lobby this weekend to get the materials! I love it! Yesterday my co-blogger and I made paper roses. It was a mess, lol. That is so pretty! I love the way the colors seem to be so full. And it’s awesome that it sounds so easy to make! This wreath is so beautiful and easy to make. It is good for any occasion. This is cute idea!! I really love doing crafts. This one I’d love to try. This is absolutely adorable!!! It looks so easy too! 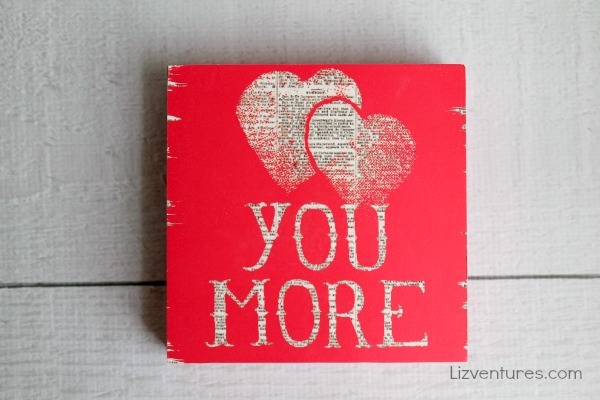 What a fun V-day craft! Very cute wreath adn so easy! Perfect for Valentine’s Day! That is so cute I love it,I will have to see if my kids want to make a wreath like that. Well that sure is a fun and crafty way to use tulle – I can totally dig on something like this! Oh my gosh, seriously so cute and easy too. My daughter would love to help me make this. My daughter would LOVE this wreath! Its so fun and girly. That looks easy to do and festive. I’ll have to try it out before Valentine’s Day. This turned out to be really pretty! If it was just red and white it could be used for Valentines and Christmas. OMG, this is so pretty! I love the colors and it’s so festive! For some reason, I never thought about making a wreath for Valentine’s Day! This is so pretty! I had no idea making tulle wreaths could be so easy! What a fun way to celebrate Valentine’s Day! This is really cute. I have a crafter friend that I will have to share this with. She love home crafts. Thanks for the great share. How cute! I can make something like this with my teen this weekend! This is so great. It looks very easy to make minus a hand cramp or two. I just love the design, thanks for sharing! It turned out so pretty! It looks so simple to make, I may just have to try making one myself soon! Okay, I am nowhere near THIS creative but surely even I can pull this together. It’s lovely! That is too cute and looks super easy to make. will have to give it a try. That is a really cute project. I love all the different colours of tulle. That is so cute! I could have never thought to make a wreath out of tulle. Wow! I absolutely love this. That is so very pretty! I may just have to do this one! I think it would look gorgeous silver and black, or silver and gold or silver, gold and black for an everyday wreath too! Ohhh this could be great! This is so pretty – there are so many choices for color combos too! I’ll try making this. It has super easy instructions that even non-creative folks can follow! That is absolutely adorable! I have some tulle, and my kids would love to make this with my daughter. That is super cute – and I love the plaque you picked up at Kohl’s. I think yours looks much nicer than many of the ones I have seen in store. Oh my, these look so beautiful. You did a great job. I’m not sure I could do such a nice job as you did. I’m sure going to try though. Thank you for sharing. 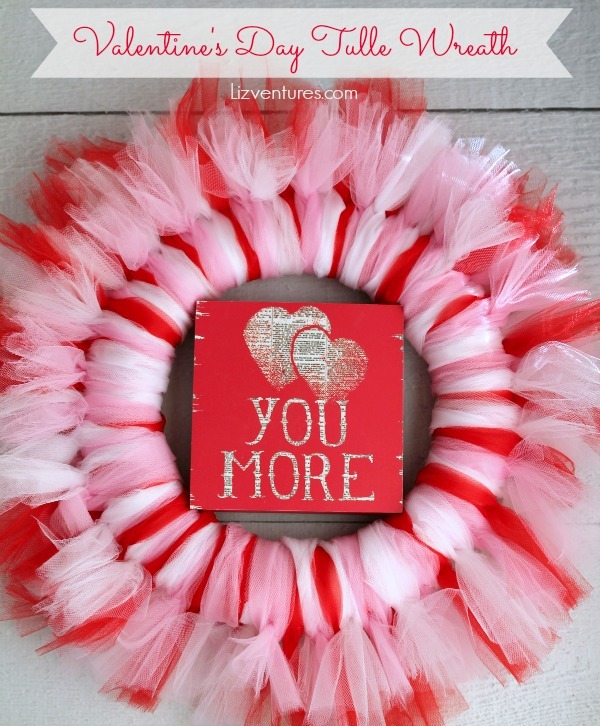 Cute little multi colored wreath with that valentine feel. I love this- it looks like a great project to do with my toddler! Wow, that is so pretty! I love how you did that! I’ve so been wanting to try a tulle wreath! I LOVE how yours turned out!!! This is a really cute idea. I love how simple it is. And what a great suggestion about changing the tulle for each holiday. That’s brilliant! This is so cute! And I seriously didn’t realize how easy they are to make. Love it! It’s a great fit! The art piece was nice but the wreath made it such a strong focal point. Nice eye 😉 I wouldn’t have thought of it. Omg how adorable, that tulle wreath! Unfortunately (though I’m not sure I’d like it even if we were like that) we’re not a mushy couple haha. My daughter and I love to craft together, and this would be a great project for us. You could totally adapt it for any occasion. Love this! I have made my daughter tutu’s using this method. The wreath came out really cute! This is adorable! It’s like a tutu on a wreath. Thank you so much for sharing! I’m loving the trend to use tulle for tutus, wreaths, and just about everything lately. It’s feminine, but not too much! I love the colors you chose. What an easy process I will have to pick up some supplies next time I am at the craft store. That is very pretty but I think I will pass on this one. It would take klutzy me forever to get it together!! 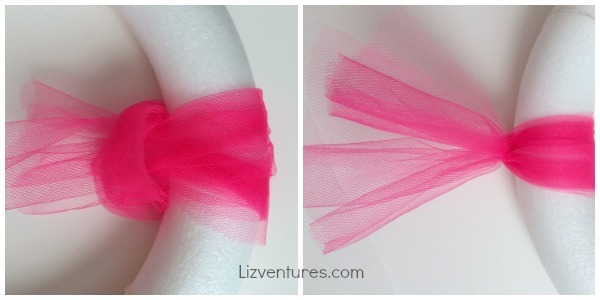 I had no idea a tulle wreath was so easy to make! I cannot wait to give this a try over the weekend. That is adorable. I am going to try this with my niece. That tulle wreath is adorable! I used to make wreaths for every occasion. I really want to get back in the habit! I love this! Such a great idea to create the wreath around the wall hanging. I love the it and you did an awesome job. I didn’t realize how easy one of those wreaths would be. That’s something my girls could have fun helping me make. Thanks! This is so cute and looks so easy! I have been struggling to find the perfect wreath for my front door but now I know I can just make it with this tutorial! I lurve this wreath! It looks like a little ballerina tutu on your door! And it looks so simple to make! I once saw someone use a pool noodle and a wooden dowel to hold both sides together. Maybe that would work! Beautiful! I love that you have pink as well, and not just red and white. Looks great! Very cute idea- and seems so simple, who knew? Thanks for sharing! I CAN DO THIS!!!! I am so excited. I make tutus for girls and this is just like making a tutu! Genius. Those are some perfect colors for the season! I love the art in the middle too! That is gorgeous. Wish I had the patience to make it. ADORABLE! I love that art piece! I’ve made a Valentine’s wreath with tulle and fleece. I love how yours turned out! That’s a really great wreath! Very cute and easy! Bahahaha, romance does make the least romantic of us a bit sappy at times, I hear ya!! 🙂 Your wreath did come out nice. I like how easy it was to make!! That is a super cute idea! Love that you told us it took about an hour. very cute idea and the tulle is so functional to work with. <3 it!! Oh I just love this. It looks easy to make and it’s really pretty too. Nicely done! I am the girly-girl who loves all things pink, too! I could totally picture one of these on my front door! That is way easier than I thought it would be…..this is coming from someone without a crafty bone in her body LOL.